Amalia Sparkle Heel https://www.review-australia.com/au/amalia-sparkle-heel-black/RE18ACC197.REBLK001.html Sparkle like a princess in the Amalia Sparkle Heel in Black. These pointed-toe heels are deserving of your fanciest frocks with their sparkly detail and ribbon tie. In iconic Review style this shoe features a pink sole with metal love heart detail. 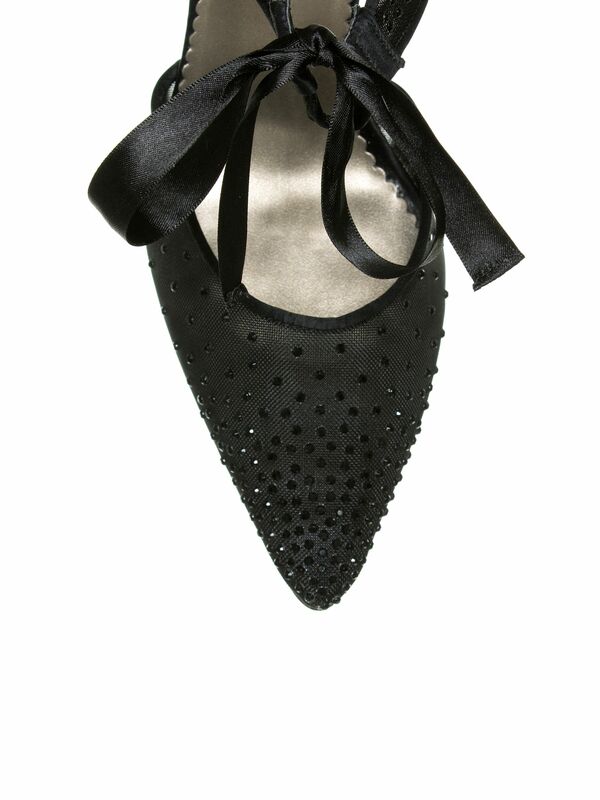 Sparkle like a princess in the Amalia Sparkle Heel in Black. These pointed-toe heels are deserving of your fanciest frocks with their sparkly detail and ribbon tie. In iconic Review style this shoe features a pink sole with metal love heart detail. Amalia Sparkle Heel is rated 4.8 out of 5 by 18. Rated 5 out of 5 by Ash A from Beautiful I chose these shoes for my wedding. I could not have been happier. They are beautiful! I wore them all day and all night. I don't often wear high heels. And these were super comfy, elegant, and I got so many compliments about them. I did have to go a size smaller then I usually take. I will be going back to get the black pair like this. I highly recommend this pair of shoes. I love them! Rated 5 out of 5 by Salpal from Great fit. Excellent service. I had a work function to attend... cocktail party. I visited the Melbourne Central store and found your assistants there extremely helpful. Nothing was too much trouble. The helped me to coordinate the dress with shoes, belt and cardigan. I received lots of compliments on the night and felt very special. Rated 5 out of 5 by Deemac20 from Gorgeous! Gorgeous shoes! I’m always worried buying shoes online, but going on a previous in store purchase I bought these shoes in a size 9. I usually wear an 8 1/2 and these are a tad roomy but wearable. A size 8 would have been to narrow for my wide foot. Can’t wait to wear these shoes out to dinner! Rated 5 out of 5 by Kimberly Jane from Classy Shoe This shoe adds that extra zing to an evening/formal outfit and goes well with many different colours. Fit is true to size and I found the shoe to be quite comfortable in terms of heel height and not rubbing on your toes and heel. Rated 5 out of 5 by Melbourne cup from Stunning Truly felt like Cinderella. Absolutely gorgeous shoe. Comfortable and felt a million dollars in them. Truly complimented my Jasmine garden maxi dress from review and my royalty hat for Melbourne cup day. Rated 5 out of 5 by Mindy from Gorgeous & lovely fit! Bought these for a cocktail party & they feel as lovely as they look. Danced all night without issue & I received many compliments! The staff were so good & helpful at the Adelaide City store. Rated 5 out of 5 by Teneal from So classy and sparkly I ordered these online and picked up in store. They were ready for pick up the next day. Beautifully packaged and an effortless transaction. They are more beautiful in real life.